I stumbled across this on other blogs I follow so I'm adding this to my blog today. 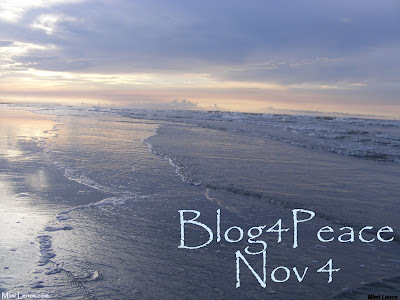 We're supposed to blog about peace and this is kind of an apt subject for me. So much has changed in my life since embracing "living with gratitude", which could also be "living with peace". When we say we want "peace", the immediate thought is a world without war. That kind of goal, while nice, is too big for us to accomplish. Seriously. Unless humans get a personality transplant, there will never be a time of no war. But, changing yourself to reflect peace, now that's much easier to do. If enough people embrace peace, live with peace, live peaceful lives, then the overall goal of a world without war slowly become a reality. So, I'm adding my small voice to the blogosphere today. I caught the girls sleeping near each other yesterday on the bed. It was no small miracle that I didn't notice them because they were at peace with one another. If these two can get along, we all can. I like the idea of reflecting peace. It's doable. Welcome to Blog Blast! Every voice counts. Thank you for joining us and sharing that peaceful moment between your girls. I am convinced that our words are powerful and that they bring about change.